Wheat & Weeds: The Pope & The Potus: Protocol Fail? 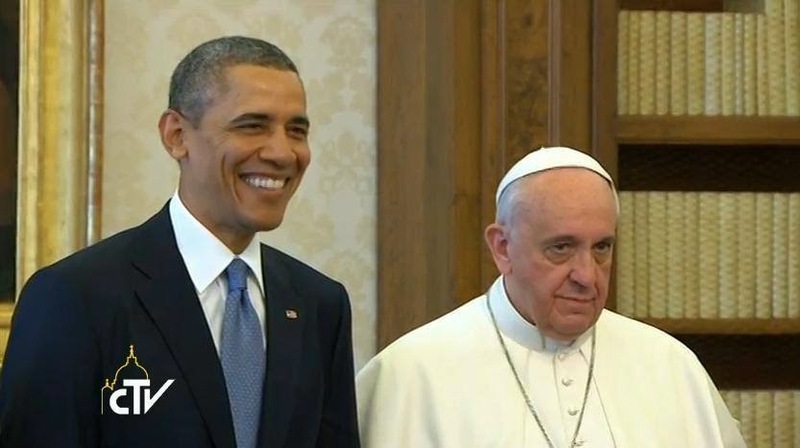 The Pope & The Potus: Protocol Fail? How today's encounter between Francis & Obama went depends on who you're reading. "My" side thinks this photo says it all, and reads the Vatican statement on the meeting and, knowing Vatican diplomacy, is pretty sure Francis -- and later his Sec. of State-- was pretty insistent on religious liberty. The President said the topic hardly came up (I don't believe him, but since the meeting was private who can disprove it?) and in candor there were plenty of pictures of the Pope smiling with the President. Watch the ABC footage provided here though (I'm having trouble embedding.) I call your attention to something else. Two something elses, actually. First, in the opening seconds, Obama BOWS to the Pope. So this is clearly just what he does, it's not really a bow, it's kind of a head bop, probably a tic he developed because he's tall. I don't actually think it's in Pope Francis' character to rebuke via grimace -- if that were his intent, the other laughing photos make no sense -- but he does seem oddly subdued with Obama here. What I find odd is that Obama chats and chats and chats sort of nervously and it's obvious the Pope is trying to follow but doesn't really know what he is saying. Finally the interpreter intervenes and Obama laughs at himself and then repeats his pleasantries to her, "Tell him I said....."
Did Obama not know the Pope doesn't speak English? I am not certain that's what we are witnessing here, but it seems like yet another massive White House protocol fail. Update: Shoot. ABC edited the footage so you can't see what I'm talking about.